Sundays — Sat evening: 4 p.m.; Sun: 11 a.m.
Daily — Mon – Thu: 8:00 a.m. In June 2009, Good Shepherd was formed from the merger of parishes Our Lady, Saint Cecilia, and Saint Anthony Parishes. Notre Dame du Port, the Church of Our Lady, was established in 1839 by Bishop Benedict Joseph Flaget on property donated by Father Stephen Badin, the first priest ordained in the United States. The first Mass offered was for the feast of Mary’s Assumption. The cornerstone was laid thirteen months later for a church that Bishop Flaget dedicated in October 1841. The steeple was added in 1850. A school for girls was established at the same time and was staffed by the Sisters of Loretto. Father N.J. Perché was the first pastor and later was named Archbishop of New Orleans. In its nearly 170-year history, this small Portland parish has overcome numerous setbacks. The damage done by several floods made it necessary to rebuild the church twice, the last time in 1873. The 1937 flood caused great damage to the interior of the church. The construction of a floodwall that would protect Portland from further flooding eliminated a sizable number of homes in the parish; later, the construction of the Shawnee Expressway further reduced the size of the parish. Our Lady School was established in 1857 and was staffed by the Sisters of Loretto until 1909, when the school closed for four years. It opened again in 1913 and was staffed by the Sisters of Mercy. In 1971, Our Lady, Saint Anthony, and Saint Cecilia schools joined to become the consolidated school Community Catholic. It closed in 2003. Despite these obstacles and the declining number of Catholics in West Louisville, parishioners’ loyalty to this historic parish remains strong. Saint Cecilia Parish was founded in 1873 to serve the immigrant Irish in the Portland area of Louisville. Originally it was developed to accommodate the growing Catholic population between Saint Patrick and Our Lady parishes. Father Theodosius McDonald, a Carmelite priest, was the first pastor. On January 1, 1926, the Congregation of the Resurrection assumed responsibility for Saint Cecilia, where Resurrectionists provided continuous pastoral care for seventy-six years until 2002. Catholic education has been a central ministry of the parish. Saint Cecilia School was in existence from 1874 to 1971, when it combined with Saint Anthony and Our Lady to form Community Catholic School, which operated from 1971 to 2003. After the school closed, the Community Catholic Center was formed to raise funds to provide Catholic education for the children in Portland. One of the most urgent challenges of the parish is responding to the needs of a community where 55 percent live in poverty or are at risk for poverty, violence, drug abuse, and sub-standard housing. Plans were made to transform the school building into thirty apartments for low-income senior citizens. Evangelization is also a great need, because a high percentage of the population in Portland is unchurched. In its 130-year history, Saint Cecilia Parish has been a rich source of religious vocations. Thirty sisters, twenty-two priests, and three brothers have come from this Portland parish. When it was merged with Saint Anthony and Our Lady, Saint Cecilia was a smaller parish of approximately 300 parishioners, and although small in number, it still served as a beacon of hope and loving care for many in the Portland community. 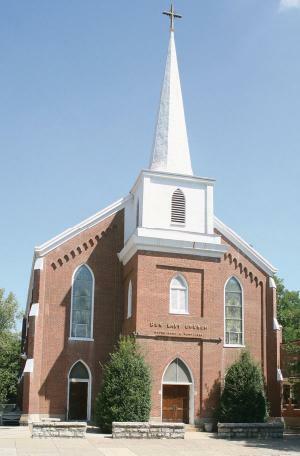 The eighth-oldest parish in Louisville, Saint Anthony has a tradition flowing from a formation process begun in 1866 by Bishop Peter Joseph Lavialle. Franciscans of the Order of Friars Minor Conventual came from Syracuse, New York, in 1867 to shepherd the poor German immigrant families settling in the West End. By November, Father Bonaventure Keller, O.F.M. Conv., had overseen the construction of a stone building for the church, rectory, and a school that had previously opened in rental property with twenty pupils. Father Pius Kotterer, O.F.M. Conv., was St. Anthony’s first pastor. The next generation built the present church, dedicated in 1887. Its steeple and bells were completed in 1904. Franciscan Sisters arrived in 1869 and directed the school until 1899, when the Ursuline Sisters of Louisville began staffing it. The school closed in 1971. The destructive Ohio River flood (January, 1937) was followed on January 26, 1939, by a fire that devastated Saint Anthony’s church, school, and convent. The first Mass in the repaired church was celebrated on December 8, 1941, but restoration was not completed until 1947. The new marble furnishings had spent World War II buried in a farmer’s field in Italy. Saint Anthony Day at Fontaine Ferry Park (1939-1958) annually drew parishioners and friends, including former parishioners who had moved to suburbia. Today the parish extends invitations for the annual feast day celebrations of Saint Anthony and of Saints Peter Claver and Columba, the patron saints of two closed parishes whose members have joined this community. Saint Anthony Outreach (founded in 1992) and Edge Outreach extend into the larger West Louisville community and share maintenance expenses, which is important stewardship for the large and aging facilities. When it merged with Saint Cecilia and Our Lady Parishes, Saint Anthony had 300 parishioners who took pride in its diversity and beautiful structure.